This bar is an improvement on the s’more. 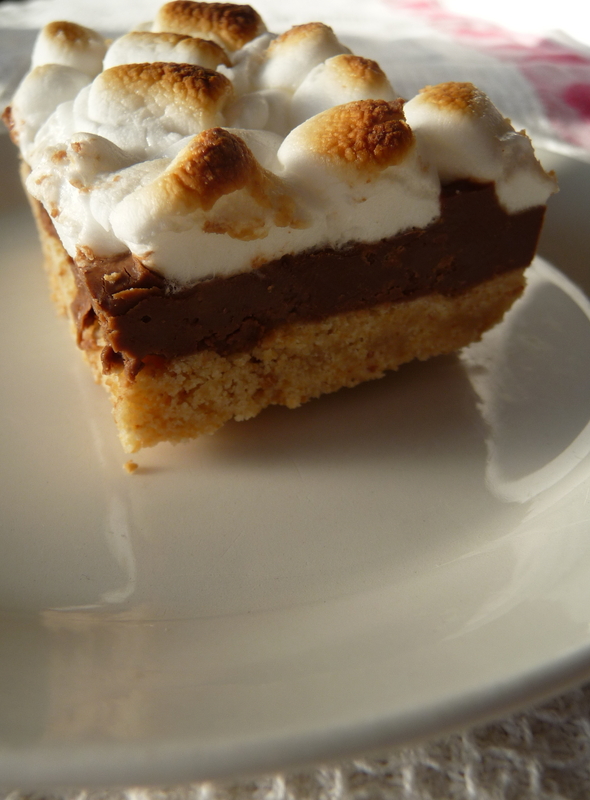 The crust alone is more substantial and more crunchy than the base of the traditional s’more – not to mention it is a fast, easy dessert to prepare for an indoor or outdoor party. The milk chocolate chips are more traditional, but I suggest semi-sweet chocolate for a slightly less sweet and, dare I say,more sophisticated version. One variant occurred to me is that a s’more bar is not far from a rocky road – chocolate, marshmallow, and walnuts traditionally (in chocolate bars, ice cream, or fudge). 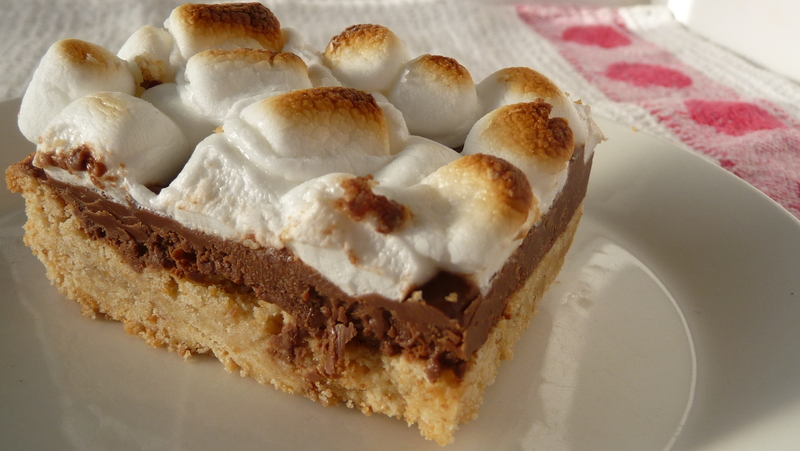 Adding chopped nuts to the chocolate layer would transform the s’more bar into a rocky road bar. This would give added texture, a nuttier flavour, and added nutrition – while marshmallows do not make it into the category of “super foods”, walnuts do. What versatility in a recipe! 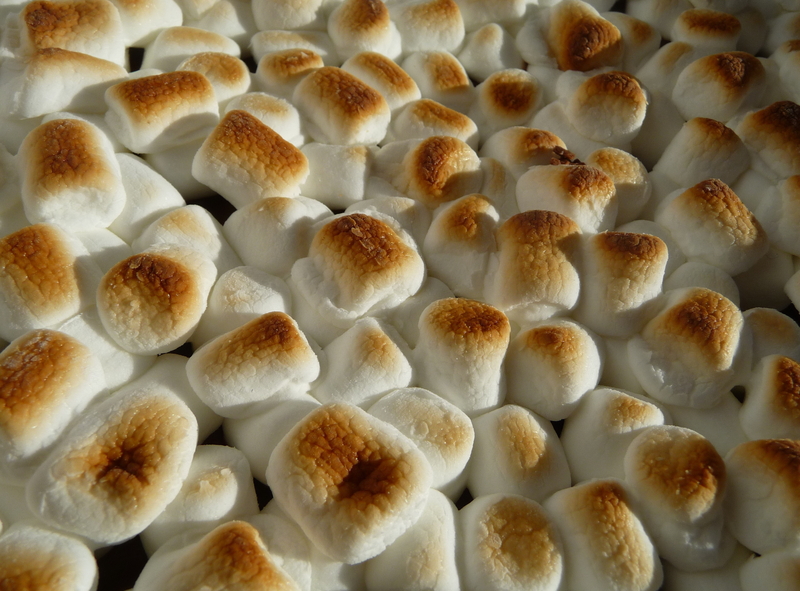 Next time you are craving s’mores or have a bonfire/potluck to attend, try this fast and satisfying recipe – without even having to make a campfire first. 1. Pre-heat your oven to 375° F and place rack on middle rung. In the bowl of an electric mixer, cream butter and sugar until smooth, about two-three minutes. In a separate bowl combine the flour, salt and graham crackers. On the lowest mixer setting gradually add the dry ingredients to the wet and then mix until well blended. Add up to ¼ teaspoon of water to the sides of the bowl, drop by drop, just until the dough separates from the sides. 2. Press the soft dough into an un-greased 9×13-inch pan, preferably non-stick. 3. Bake the crust for 20 to 25 minutes or until slightly golden-brown and just set. Remove from the oven and sprinkle then spread the chocolate chips evenly over the top of the crust. Allow the base and chocolate to stand for five minutes or so to allow the chocolate to melt slightly. Spread chocolate with off-set spatula. 4. Set the oven knob to “broil”. Sprinkle the mini-marshmallows evenly over the melted chocolate, covering it entirely. 5. 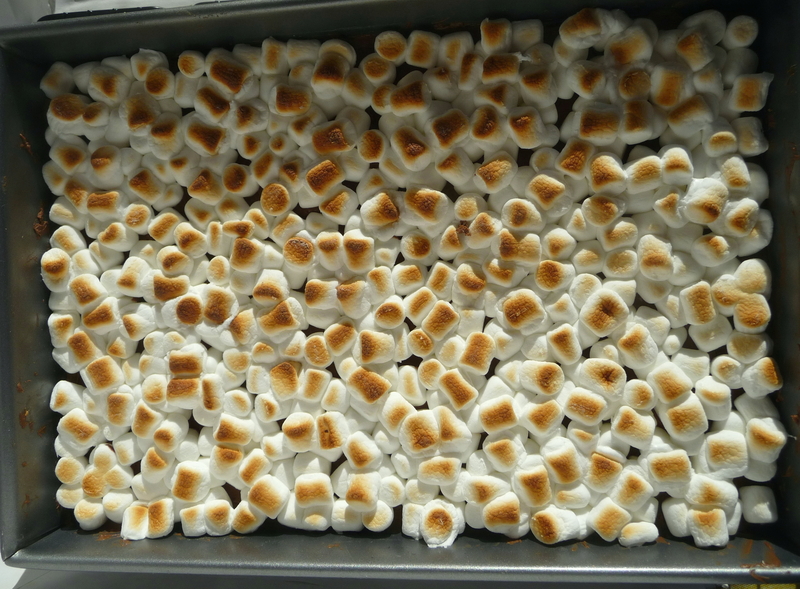 Broil the pan, with the top of the marshmallows no closer than five or six inches from the heat for about 30-60 seconds, or until the marshmallows are evenly toasted and browned on top – watch the entire process carefully and do not leave, lest you want burnt rather than toasted marshmallow! Remove from the oven and allow to cool for at least 15 minutes. Cut into bars, approximately 2” by 3″. Variant: add 1 cup of chopped pecans or walnuts (other nuts could work) on top of the melted chocolate (step three) to make a rocky road bar. This entry was posted in Baking, Cookies, Dessert, Recipes Misc and tagged Baking, bars, Chocolate, Dessert, easy, fast, graham crackers, marshmallow, Recipe, s'mores. Bookmark the permalink. Thanks, Kath. You’re right about the butter making it richer than the campfire version. At least this interpretation is unlikely to cause burnt fingers! Hi, Michele. Thanks for your input. I am trying to do more savoury items, most of which are mainly vegetarian – or very close – these days (are you not making Nanaimo bars for your son now?). Fast soup is a current pre-occupation of mine, so you’ll see more of that, too. Let me know how the mushroom soup works for you. I am in love with Jinja. I think I should also start posting pictures of my kitties – I am forever photographing them. Your campfire treats look super. Thanks, Mandy. I encourage you to post your kitties, too. While I restrain myself (such as the pictures of them around food I am shooting…), they are good subjects I think. S’mores probably have not made it big in South Africa or Mauritius, I bet, though they are easy to make. I haven’t had these since I was 15. I haven’t thought about s’mores until this post of yours. If I find decent-tasting marshmallows I’ll give these a shot. Hi, KM. I’d only been to day camps or log-cabin accommodations as a child, until Vanuatu, but that’s an entirely different story. Too bad about the Pearl Jam camping experience! I hope you can uncover good marshmallows in the Philippines for these…. PS: Hi from San Francisco! Thanks, Jax. You should try these when you’re back home to introduce the whole s’mores thang to your friends in Olde England. 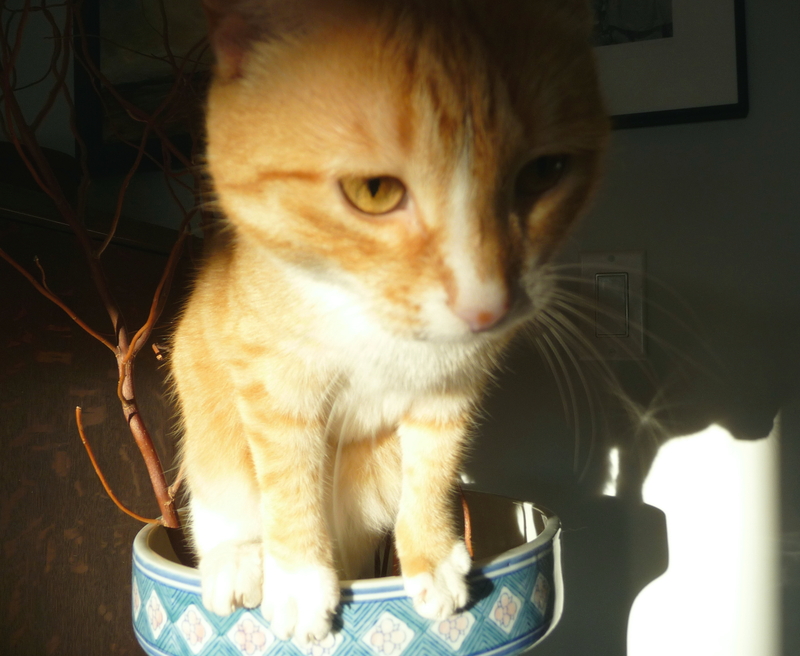 Jinja likes you, too…. I hope you’re feeling better now that you’re in NoCal. Now is the time for you to have a burrito or other good Mexican food and have lots of fun in SF! it is raining like hell today in Paris ! Salut, Pierre. It’s February, so it’s raining in Paris, no? Marshmallows toast well and do look great. Dan, this is a genius idea—s’mores definitely needed to be reimagined for indoor consumption, because toasting marshmallows over a gas burner is lame, and heating them in the microwave is just disgusting. Keep the gratuitous kitten pictures coming! Thanks, Maddie. I won’t take credit for the idea or the majority of the recipe, but it does work well, for indoors or outdoors alike. The nutty version is something I do want to try, too. My whole family will think I am a goddess this weekend for these. I am writing down the list of ingredients next and off to the store. Yours looks perfect and photographed beautifully. 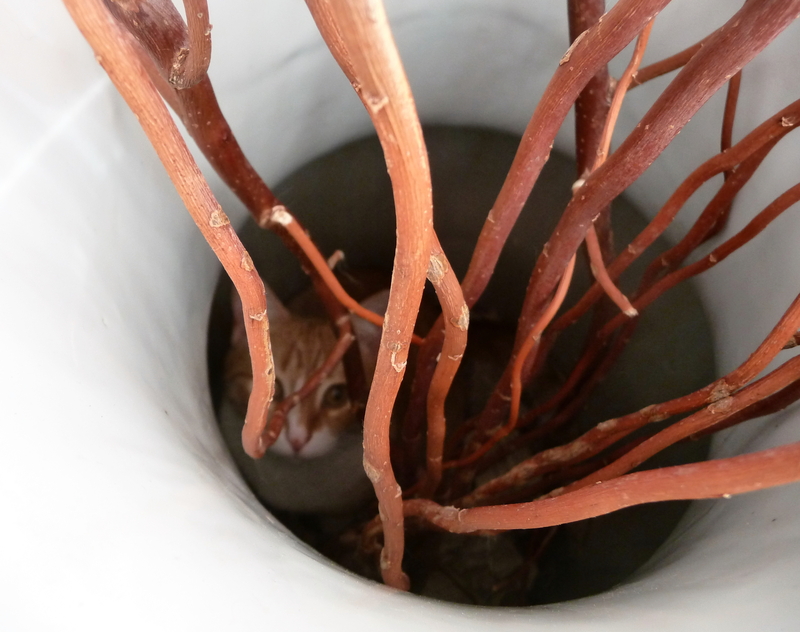 As for Jinja, I seriously thought she was at the bottom of the fire pit before the fire…apparently I am an idiot. 🙂 City girls can be so clueless. Hi, Geni. You’re too funny, really! Let me know how the bars turn out for you and whether they help you officially become a goddess at home. I was a Girl Scout for a couple years, but my troop was apparently really lame, because we never made s’mores. And I only remember going on 2 camping trips in the 4 years I was a member. My sister’s a troop leader, and has apparently just discovered an online shop that sells vegan marshmallows, so I think I’ll direct her to this recipe. And since my bambino loves s’mores (we just do them in the microwave), I’ll have to get the ingredients to try these myself too! Thanks, Rachel, for your Girl Scout story. I hope these work out well for you and the bambino. It’s good to know about vegan marshmallows for those who have those restrictions, as I recall not being able to find “acceptable” marshmallows during my more extreme – almost vegan years. I made the smores for Trevor on the weekend Dan and they were a huge hit. I tried a small, warm morsel myself (sans marshmallows which aren’t vegetarian) and it was heavenly. Hi, Michelle. Thanks for letting me know that these worked well for you. As Rachel pointed out, there are the vegan marshmallows orbiting somewhere in the blogosphere…. Hi again, Rachel. Thanks very much for following up with the useful link! Hi, Louann. You’re welcome, and I hope these turn out well for the visit with the smore-lovin’ relatives. Somehow I’ve gone through 40 years without eating s’mores. What kind of childhood could I have had? Maybe it’s time to try your bars! Hi there! 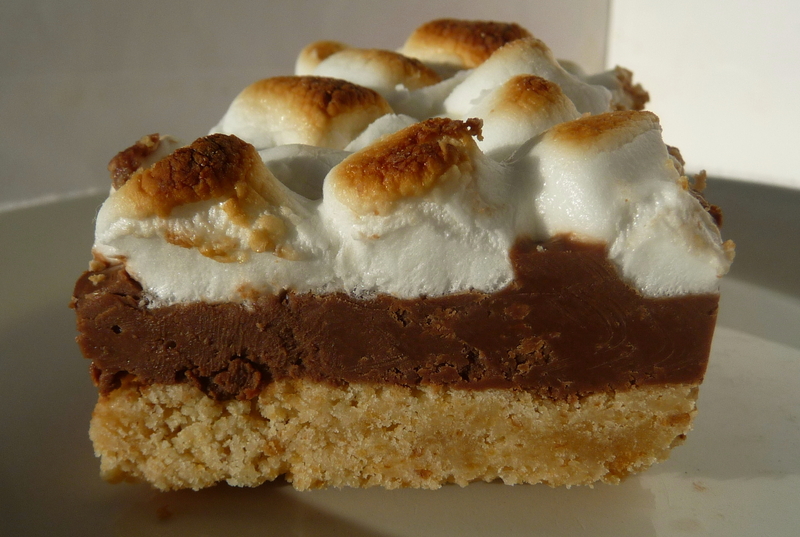 I googled s’mores bars after having one at a party not too long ago and yours was the prettiest picture out of the bunch. Thankfully, the recipe was just as yummy as your photo. These are SOOOO good!!!! =0) Thank you so much…can’t wait to take a longer peek around at your other recipes!! soon after launching it largely in the Usa and You.K. video nevertheless, all those demand a plug-in set up).